An E&S carrier considering the admitted lines market wanted to write Commercial Auto, Commercial General Liability, Commercial Property, Inland Marine, and Crime business. The project covered 30 different products to be sold in all 50 of the United States and included all the attendant filings and approvals, as well as the requisite ISO rating updates. Without the staff required for such a large project, the client sought the support and guidance of the Xceedance actuarial team. We built an interdisciplinary team comprising actuarial analysts and technologists. Our team was charged with understanding all the client’s coverages, researching the regulatory requirements in each state, preparing rate filings, and helping with rate-impact studies. The team also booked monitoring and profitability studies. In addition, we created a four-month training and pilot phase. 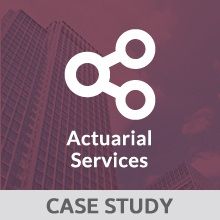 By recording training sessions, Xceedance significantly reduced the learning curve for our staff and seamlessly integrated our team with the client’s actuarial department. Our goal for the project is to automate as many of the processes as possible. In the initial phases to enable the client’s objectives, our team is leveraging deep experience with Excel macros to streamline, automate and ensure precision in the tedious and time-consuming tasks involved in rate filing. We provided the people and the tools the client needed to undertake an ambitious project on a short timeline. We allowed the client to scale quickly to introduce 30 products in 50 states. And we provided savings of as much as 50 percent, in comparison to costs the client would have incurred for an in-house project implementation approach. Xceedance provided a super-smart team. The Xceedance experts needed no hand-holding to absorb our processes and material in accomplishing this project.